On this Feast Day, we celebrate the Cross upon which Jesus died for our salvation. According to legend, the Cross used to crucify Jesus was discovered in 326 by Saint Helena during a pilgrimage to Jerusalem. 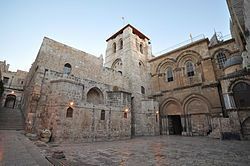 The Church of the Holy Sepulchre was then built at the site of the discovery and a portion of the Cross placed inside. The Feast Day of the Exaltation of the Holy Cross is the 14th September. Have mercy on us, forgive us our sins and save us from the tortures of hell. CategoriesSaints Library TagsExaltation of Holy Cross, Feast, What is the Feast of the Exaltation Of The Holy Cross?